By Zack Quaintance — You know it’s a strong week for new comics when we expand our top choices to six slots and still have to bump Amazing Spider-Man, Superman and Thor (three absolute favorites in these parts) down to the Others Receiving Votes section. But hey, too many great comics is one of those good problems to have, and we vastly prefer that to the alternative. This is a great week, really, for readers of all tastes. There’s another pair of new idea-dense comics from Vault, the continuations of some of the best superhero runs today, and a new series from one of the industry’s funniest satirists. It’s the type of Wednesday that reminds me why I invest myself so thoroughly in the weekly comics grind: there’s just no other medium that’s so urgent, profilify, or tonally and thematically varied. It’s a beautiful thing. Now, onward to the comics! Why It’s Cool: Mark Russell is really at home with old Hanna-Barbera properties, making him an absolutely amazing choice to revive the old Super Friends characters, the Wonder Twins. Doing this property right is a tall order. There’s just so much that can go wrong, but Russell has shown a propensity in the past for taking those ideas—a serious take on The Flintstones, on Snagglepuss, etc.—and hitting them out of the park. This could be his finest work yet, playful and self-aware and relentlessly delightful. It’s a blast to read. DC Comics doesn’t make wry fun of itself often, and I wouldn’t really want them to, but when it’s done this well, it’s something really special. Why It’s Cool: Has it been a month already since the excellent new Criminal series started? Wow, that went fast, but hey, I’m not one to complain that the best partnership in comics is back. The first issue was as immersive and authentic as one would expect from the Brubaker-Phillips all-time great crime comics pairing. This book, now on its eighth volume, just seems to get better the more its creators return to this world, the more they broaden and hone and expand upon the tone of these stories. This newest volume is no exception. Read our review of Criminal #1. Why It’s Cool: There are more than a few creative types among those of us who read monthly comics obsessively (which is presumably the core readership of this website...though we’ve—shockingly!—not had it in our budget to conduct a focus group just yet). This is a book, meanwhile, that calls to and calls out creative types on their every last insecurity, unspoken jealousy, pretension, etc., mining it all for great fantasy/horror concepts. This issue might be construed as a turning point, and, like all those that have come before it, it’s an absolutely must-read comic. Read our reviews of Fearscape #1, Fearscape #2, and Fearscape #3. Why It’s Cool: As with the rest of Vault Comics’ current slate—Wasted Space, Fearscape, These Savage Shores, etc.—Friendo is an unpredictable comic dense with ideas that have much to say about 2019 America. It’s also one of today’s best creator-owned comics, an ever-evolving story that goes to new and terrifying places every week. I’ve written this in all my reviews (and will likely do so again in the near future) but the real shocker with this story is how at first blush it seems like total sci-fi but then starts to seem increasingly likely as you delve into its horrors. Check back later this week for a full review! Read our reviews of Friendo #1, Friendo #2, and Friendo #3. Why It’s Cool: We have loved both installments of Vita Ayala’s and Raul Allen/Patricia Martin’s new Livewire book so far, and the third issue is no exception. There’s something really special happening in this comic, arguably making it the best Valiant series since Divinity (last year’s Secret Weapons one-shots not withstanding). This issue is a sort of bottle issue that sees the central protagonist engaging in a nakedly honest way with an antagonist during a prolonged bout of combat. It’s a kinetic and poignant way to get across many ideas without slowing the story’s pacing at all, and I absolutely loved it. I won’t say much more past that for risk of spoilers. Read our reviews of Livewire #1 and Livewire #2. Why It’s Cool: Magic Order #6 marks the end of Mark Millar’s first full series since signing his landmark multimedia deal with Netflix, and it’s been one hell of a way to launch a partnership. Like *insert your favorite action film here* with wizards and witches, Magic Order is an exciting high-stakes take on magical tropes, illustrated beautifully by Olivier Coipel with Dave Stewart colors. Simply put, this is a gorgeous book with one of Millar’s always-sharp concepts at its heart, and we’re excited for the finale (and also wondering if there might be more story on the way in this world eventually…). 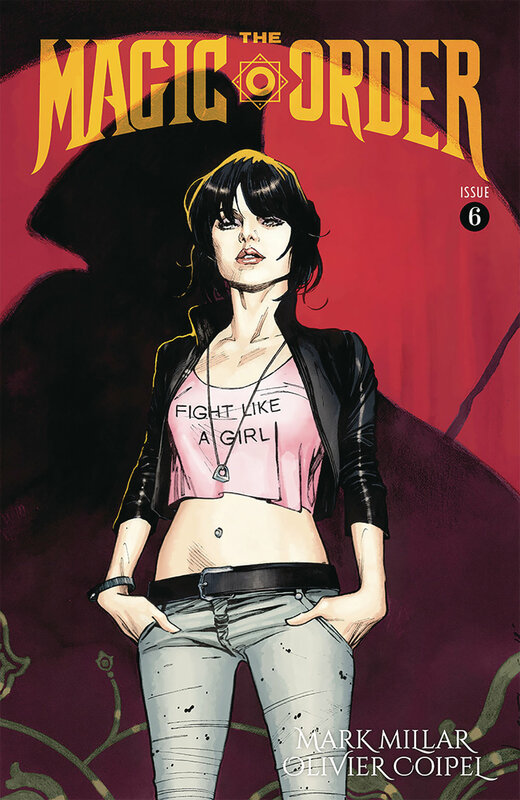 Read our review of Magic Order #5.